We have been thinking about the 34 year history of Collector’s Choice, how many artists have participated (thousands!) and how many collectors started and added to their collection year in and year out. We have reached out to some of our friends who have purchased at Collector’s Choice to ask them about a particular work of art—we are posting their stories on our blog over the next few weeks. All of the artists referenced will be returning to Greenhill this year. Enjoy their post, and we invite you to become a collector at this years’ Collector’s Choice! Shelly Hehenberger's application of magnificent colors in her artwork is exquisite in reflecting light and dark. We were thrilled to purchase "Incarnation" to add to our art collection. Her painting is abstract in structure, yet vivid in distinct expression. Shelly's bold painting style with under-painting harmonizes with areas of her work that are finely detailed. 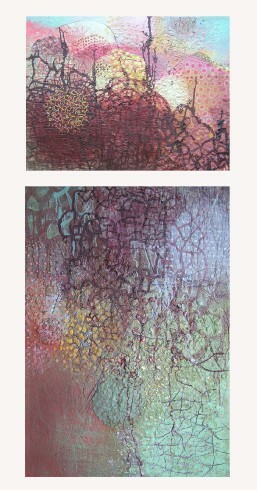 Her ability to weave color, definition and texture defines her work as a treasured focal point in our home!